Orthodontist in Thonon-les-Bains. Specialised in conventional as well as invisible orthodontic techniques. Dr Lebahar, Orthodontist holding a United States diploma, has been proposing the Invisalign procedure since 2003 in his Thonon-les Bains practice and he holds the Platinum expert title. To respond to the patient’s increasing demand to obtain their dream smile without pain nor brackets, Dr Lebahar proposes treatments at the forefront of technology, through the materials used and his expertise. Solid and supple at once, the devices are improved along with the latest technological evolutions. They are free of bisphenol and 100% biocompatible. As an alternative to traditional brackets that may irritate your moth, there is now an invisible and comfortable orthodontic alternative: Invisalign Aligners. The aligners are worn in sequence, one following the other. The treatment is composed of a number of different aligners, which vary in shape depending on the severity of your malocclusion and the quality of the bone supporting your teeth. Each aligner is worn for a specific time period and then replaced with the next one. They are conceived to move teeth in an incremental manner, to finally bring them to their final position. The final position of your teeth will first have been determined via a simulation of your smile or « Clincheck » that Dr Lebahar will undertake at your first meeting. He will show you the result and you will decide together what you would like to change from an esthetic point of view so that you are happy with your smile. The forces exerted by these invisble aligners are particularly low, making them perfectly adapted for cases of loosening or otherwise traumatised teeth. The technique is perfect for adults. The aligners integrate your life with discretion and gentleness. Ask your practitionner today how Invisalign can improve your smile ! 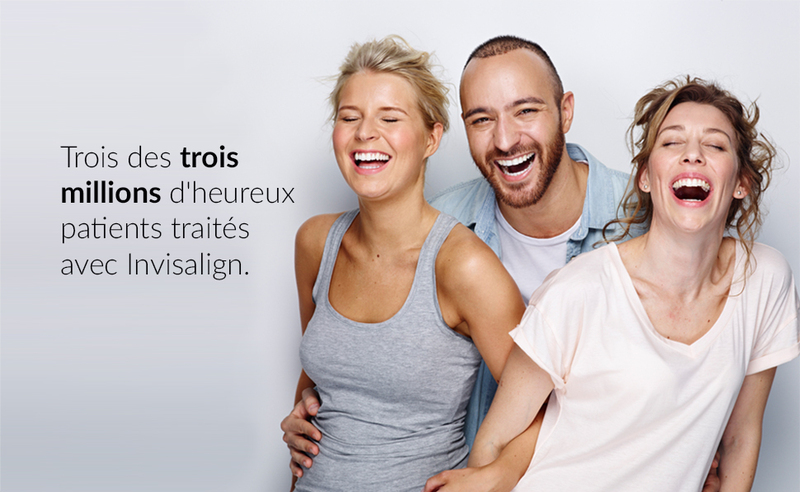 With the help of Invisalign, Dr Lebahar, Orthodontist in Thonon-les-Bains, can treat the majority of orthodontic problems. Invisalign is transparent, removable and comfortable. The treatment does not interfere with your daily life and no-one will notice that you are wearing a dental device. You can smile during and after your treatment and since Invisalign is removable, you can eat and drink whatever you like. Studies have also shown that during the treatment, Invisalign is better for your oral hygiene, compared to a non-removable traditional device. Receive a free coupon for the first consultation or send us any question you may have. now let’s make it real together.